I'm impressed once again. A nice presentation and soft scrolling brings the race track into your living room. I hope there will be a cartridge release! Great job! - The start animation would require some manual pixel adjustments. - The camera seems a bit wild... I don't think it really disturbs during playing, but a little less aggressive movements would probably work better. Man looks nice.. cant wait to play it! - After start, cars pass under a billboard, is it a sprite billboard? 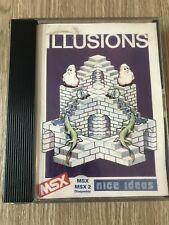 - Is doable to turn on Screen 4 when game runs on Msx2? In this way we can have 8 sprites on a line and no flickering. As per usual I'll convert it to a CAS file so that anyone with a CASDuino can play it. Very cool! Something very, very, very nitpicky (but details man, details ): displaying 'fastest lap' after the 1st lap is, say, lame Perhaps just display 'first lap!' then or something? Thanks everyone!!! I'm quite happy with the engine, but a few of the things that have been pointed out are true! - As for the starting animation, the pixel artifacts in the flag are a result of the way it works. I will elaborate a bit more on that after work. But fixing those will be pretty hard!